Known for different names in different Indian languages these Dill seeds are added to traditional Indian dishes to enhance the flavor. They add a strong tangy and appetizing flavor. In Hindi it is known as “ Soyo” or “Suva”, Sadapa Vittulu in Telugu, Saluka in Bengali and Shepu in Marathi are some common names of this green herb. The applications of Dill seeds are not limited to the kitchens only as the essence oil of Dill seeds has other uses too. You can use both seeds and fresh green leaves of Dill plant. This herb contains high nutritional values and the Important Vitamins & Minerals are present in ample amount. For the prevention and cure of various diseases, the usage of Dill seeds is quite popular. Here in this article, we will look at the various health benefits of this amazing herb. The fresh green leaves and also the seeds of this spice contain high nutritional value. The Dill contains healthy vitamins, minerals, and organic compounds. Powerful monoterpenes such as carvone, limonene, and anethofuran, as well as important flavonoids like kaempferol and vicenin are also present. vitamin A and vitamin C are present in a significant amount of and traces of folate, iron, and manganese can also be detected. Fungal infections are one of the important reasons behind Dysentery. Dill seeds essential oils are disinfectant in nature and are very helpful to effective inhibition of fungal infections. Dill/Soyo/Shepu/Anethum graveolens seeds are also known for its anti-inflammatory properties as they help effectively to reduce the inflammation and the pain associated with diseases such as gout, rheumatoid arthritis, and arthritis. From ancient times Dill seeds are being used to cure such diseases. The dill essential oil is a good source of flavonoids and well known for stimulating and Emmenagogic nature. Dill aids the secretion of certain hormones which are necessary for proper menstrual cycles in women. The anti congestive and antihistaminic nature of Kaempferol and certain other components of flavonoids and monoterpenes in dill essential oils helps to clear congestion in the respiratory system due to allergies, histamine or coughs. Dill/Soyo/Shepu/Anethum graveolens seeds and its fresh green leaves are the effective mouth and breath fresheners. The germicidal, antioxidant and disinfectant nature of dill essential oils present in this help to end microbial infections. Certain important antioxidants are good for minimizing the damage caused usually caused by free radicals. Dill seeds contain Monoterpenes which are chemopreventive in nature. Monoterpenes activate the secretion of an enzyme which is known as glutathione-S-transferase. This radical glutathione is an antioxidant which neutralizes carcinogens. It can neutralize Cyano- and Benzo- derivatives and other free radicals, thus prevents the human body from the threat of cancer. There are other important antioxidants present too which contributes to cancer protection. A healthy digestive system and proper digestion are must for a healthy body. 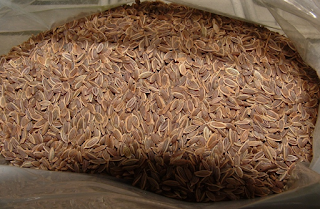 Dill Seed is an important appetizer and hence widely used in culinary applications. Dill not only adds the powerful aroma and a great taste to the food but also the essential oils present in dill are very important for the digestive system. These oils have a stimulating effect and activate the secretion of bile and digestive juices. These oils also trigger the peristaltic motion of the intestine; ease the passage of bowel movements and prevents constipation. Sleeping disorders are very common nowadays and this is only because of the faulty and stressed lifestyle of ours. One of the important remedies for Insomnia could be the addition of dill seeds in your food. The essential oils found in dill seed have amazing properties. These are, stimulating, sedative and hypnotic. The vitamin-B complex and flavonoids present in the essential oils of dill seed activate the secretion of specific enzymes and hormones which are necessary for a good sleep. A Dill seed also contains calcium content. The deficiency of calcium can cause a big trouble, as calcium is the main constituent of bones. The calcium content of dill protects you from bone loss and also from the loss of bone mineral density. You can prevent diseases like Osteoporosis as its consumption leads to the proper growth and development of human bones. It also helps in the repair of injured bones. Dill Seeds are also healthy for a person having Diabetes. It is important for these people as it manages the insulin level in the body. Studies have shown that its consumption can help in reducing the fluctuations of serum lipids. It also helps with the insulin levels in corticosteroid-induced diabetes. Dill seeds are good carminative too. Excess gas in the body is not good for delicate organs of Chest cavity and cause embarrassing in public places. It forces the gas to travel downwards through the digestive tract. Dill Seeds have important antimicrobial properties and hence prevents and microbial infections throughout the body. Hence it provides the necessary immunity to the body against several infections. Hiccups could occur due to trapped gas and the upward movement of gasses via food pipe or due to certain allergies, hyperactivity, hypersensitivity, and nervous malfunctioning. Dill can help in these situations effectively. As we know that dill seeds have carminative properties it helps with the expulsion of gases and also works to reduce gas formation. It is also a natural sedative and helps to calm down hiccups. Dill Seeds can help you if you are having diarrhea. Indigestion and microbial action are the main cause of this health issue. Dill seeds have very good digestive properties and to prevent microbial action compounds like monoterpenes and flavonoids present in the essential oils of dill seeds. Avoid washing before storing in the refrigerator. If you find some bugs or farm soil on leaves then wash off gently and let them dry. Store only moisture free Dill weed in the refrigerator if you want to store them for a long time. After you harvesting dill or buying fresh you can wash them if any Dirt or Bug appears. If not then simply put them in a plastic bag or in a glass jar to preserve the aroma of fresh Dill. Place some hand towel to absorb the moisture inside the bag or jar. For best results, keep the temperature below 40 degrees F.